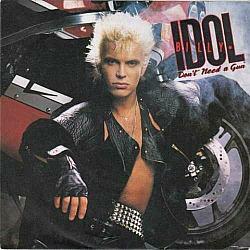 Don't Need A Gun was released in March 1986 and peaked at #26 in the UK singles chart. It was Billy Idol's second single release from the eighties rock album Whiplash Smile, and the follow-up to To Be A Lover. A third single from the album Sweet Sixteen was even more successful, reaching #17. I'll never quite understand why Don't Need A Gun wasn't a bigger hit, as many fans (including myself!) believe this was one of his best songs. Overall, the former lead singer of punk band Generation X has released seven solo studio albums and 34 singles. His biggest hits were the 80s songs White Wedding and Rebel Yell which both peaked at #6 in the UK singles chart during 1985.